High Street, Winchester, southwest of London. Winchester, a city 68 miles southwest of London, was the seat of government in England until the 12th century, and the center of its trade in wool. 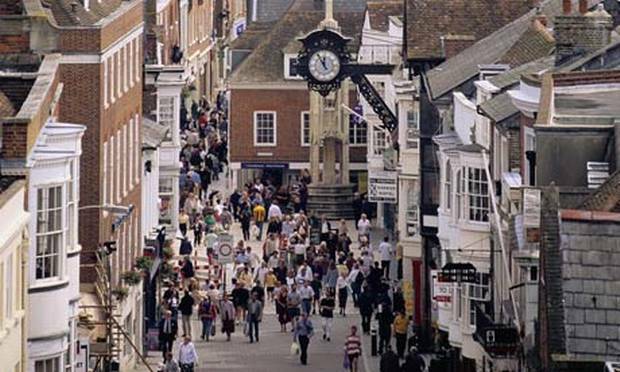 The town figures as Kingsbridge in Ken Follett’s novel “The Pillars of the Earth.” Winchester Cathedral is memorialized in song for “bringin’ me down” when “my baby left town.” Winchester’s High Street is northern Europe’s oldest active main street. It retains its historical character but is about to be vandalized. At the same time, Moat Brae House, in Dumfries, Scotland, is also about to be vandalized. The garden at Moat Brae is where the 8-year-old J.M. Barrie played at pirates. It inspired the Neverland of “Peter Pan: Or, the Boy Who Would Not Grow Up.” Moat Brae now cowers in the shadow of our era’s Captain Hook. The vandalization looming over both places, common nearly everywhere, is that of insensitive architecture set into beloved places. The plan in Winchester would drop a huge retail development just off its High Street. In Dumfries, a much smaller but equally irksome plan would add a café/book shop and an “education suite” to Moat Brae House. Designed in 1823 by Walter Newall, it was saved from demolition five years ago and has now been restored. The additions are not yet designed but, as described in proposals, sound out of character with the enchanting effort — including a restoration of the Neverland garden — to revive a site that had fallen into ruin and use it to teach children about their own branch of literature. The Winchester plan would slash at the historic weave of the city’s intact fabric. The buildings proposed are hugely out of proportion and of poor design. To judge by images available, they vaguely mimic historic shapes, like bones tossed out to placate the hounds of opposition. The shallow setbacks and contemporary materials seem unlikely, even with the assistance of time and weather, to help the project blend into the historic context. Rather, they would plug up the keyhole by which residents and visitors alike peek into the history of Britain. This threat to Winchester should have Britons up in arms, along with the British diaspora, not to mention citizens from lands, like America, that value British history as a cornerstone of nation and freedom. But the looming fate of Moat Brae pulls on the very heartstrings of our youth, for who among us has not visited Neverland? Speaking of nefarious work, these developments are familiar to Americans. British architects and planning authorities, like ours, are taught to consider new architecture inspired by the patterns of history in the places we love as mere nostalgia. They believe that architecture should “reflect its era.” Fine. But their conception of our era reflects a narrow, ideological vision that worships the machine, cuts humanity’s link to life apart from the machine, and harks back to a future inspired by vintage early ’60s Jetsons cartoons, of all things! Any third grader would understand (Barrie was of that age when he played at Moat Brae) that however it may look, anything built in our era is of our era. So why not let it fit in with the streets of Winchester or Dumfries? The Captain Hooks of development, scowling beneath their skull and crossbones, can declare all they like that an inappropriate project fits in. Peter Pan, Tinker Bell and their friends will know what to think about it. My son, Billy, who is 5, loves “Jake and the Neverland Pirates,” which I endure better than I do his infatuation with reruns of the egregious “Scooby Doo.” I long for the day we introduce him to the real Neverland. The possible vandalization of Moat Brae saps the idea of a visit. In Britain, planning officials are obliged by law to treat the public as a stakeholder. But unofficial feelings about that seem to be reflected in the difficulty of submitting an official objection, especially for those lacking a British postal code (required by the form). There is even a list of “material” reasons that must be heeded. Those who want to object to the Winchester project should Google “Winchester Deserves Better” to reach a site that offers one email link to all the city councilors involved. Objections to the Moat Brae project might as well be directed, it seems to me, to Tinker Bell. Those with finer Google skills might have better luck. This entry was posted in Architecture, Architecture History, Books and Culture, Development, Other countries and tagged Britain, Moat Brae, Scotland, Winchester. Bookmark the permalink.